Is GMAT Integrated Reasoning More Important Now? GMAT score, in other words what is included in an official GMAT score report? The first thing I'll say is when you take the GMAT you get five different scores. A score for each of the four sections and an overall GMAT score. So how does work? 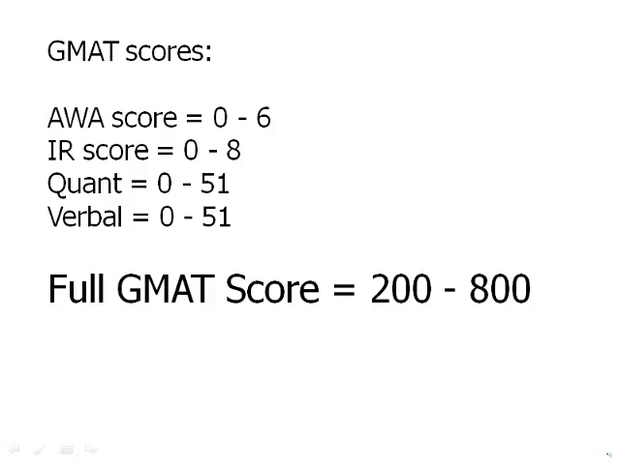 Here is the sum total of what you get on a GMAT score report. You get an AWA score, scoring your essay that goes from zero to six. You get an integrated reasoning score which goes from zero to eight. . You get a quantitative scale score which goes from zero to 51. A verbal scale score that goes from zero to 51. And then your full GMAT score that goes from 200 to 800. Important point number one, only the quantitative and verbal have influence on the full GMAT score. The IR and the essay are entirely separate, they play absolutely no role in contributing to the full GMAT scores. It's purely based on your verbal section and your quant section. Important thing number two to appreciate is that when business schools look at this, 90% of what concerns them is the full GMAT score. Business schools, apparently, at least right now, are not relying a whole lot on IR score or AWA score.